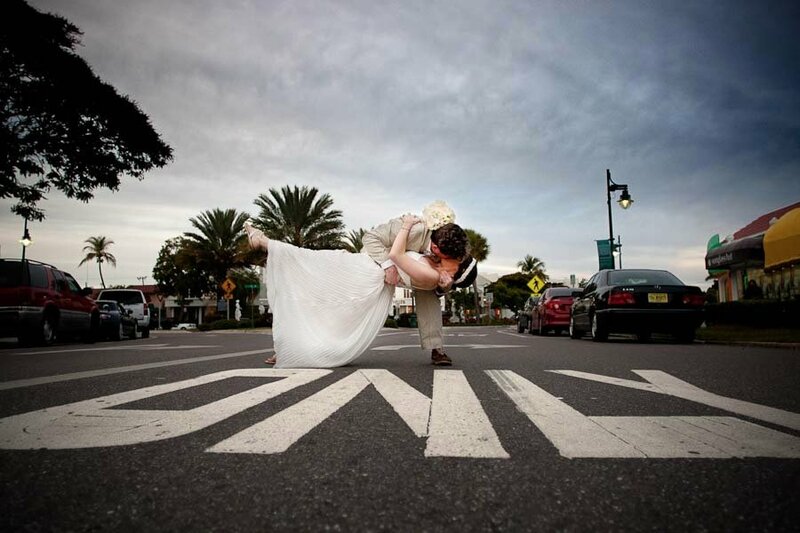 If you’ve chosen Sarasota as the site for your Florida wedding, you’ve chosen well. And if you’re still on the fence, here’s some background information to consider: Sarasota, south of the Tampa Bay area and north of the Naples Fort Myers area, is known in the region as being a center of arts, culture and natural beauty. It has stunning beaches and luxurious beach resorts perfect for an exotic destination wedding that’s still located in the contiguous 48 states. And if that weren’t enough, it even encompasses several islands! The islands that separate Sarasota Bay from the Gulf are known as the keys, and Longboat Key, Lido Key and Siesta key are all renowned worldwide for their beautiful white sand beaches and brilliant clear water. Of course, if you’re planning a Sarasota wedding, you’ll also need a Sarasota wedding photographer. The trick is choosing the right one. Because Sarasota is a popular tourist spot, there are quite a few Sarasota wedding photographers; that doesn’t mean, however, that all of them are equally skilled at capturing the best moments of your special day. Most married couples will tell you that your wedding day goes by so quickly that it’s truly through your photographs that you remember your wedding, meaning you’ll be seeing your wedding day through your photographer’s eyes for years to come. So what can you be looking for when you’re trying to pick that perfect photographer? It’s important you find someone with whom you feel instantly comfortable, so that you can feel relaxed and like yourself, even if you haven’t spent very much time in front of the camera. But it’s also important you choose a photographer with proven experience, technical skill and the right gear and equipment — and that goes double if you’re planning on a beach wedding. The beach is a beautiful backdrop, but it also presents some challenging conditions because of the bright and ever-changing light, the wind and the sand. You want to find a photographer who has experience working in that environment so you can simply enjoy the best day of your life to date without worrying about how the photos will come out. With 20 years of experience shooting weddings in the west coast of Florida, Horatio Franco and his team at Studio Four Photography, will guarantee that your memories are recorded flawlessly and professionally.